It's a little worrying that one of my most popular posts was when I mentioned my manhood. Just shows what it takes to get an audience. Anyway, just back from Washington and counting the hours down to bedtime. I got off the plane at 0900 and I feel exhausted. I can never sleep on a plane! Just too much going on. 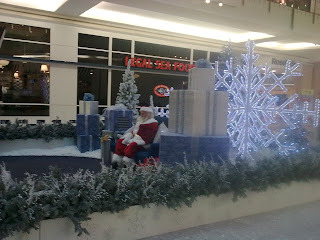 I took a nice photo of Santa in Tyson's Corner. Made me feel all Christmassy. However, it did make me feel a bit of a pervert taking photos of Santa from concealment. Brand New Second Edition. More pages, more characterisation. On Librarything http://www.librarything.com/er/giveaway/list giveaway of Drachar's Demons, the first book in the series Prophecy of the Kings. Check it out and enter to get a chance to win a copy. Anyone read it then let me know what you thought. Reviews welcome. Great tales for a winter's night. Just what the Fantasy Doctor ordered. 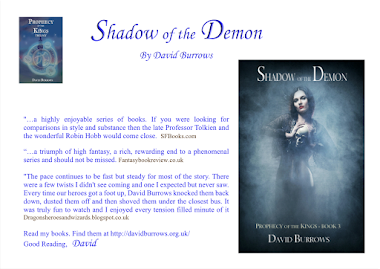 http://www.fantasybookreview.co.uk/book-reviews/drachars-demons-by-david-burrows/ Great reviews from a great site! I was fortunate to meet Brent at FantasyCon. My son had him sign both books in the new series. Brent read an excerpt (supposedly) from his next book after Blinding Knife. He has a very distinctive style of reading and I could hear his voice as I read Blinding Knife. That was a little unsettling! Fortunately the excerpt turned out to be as much fantasy as the book! He had us all believing he was going to kill off one of his main characters. He may still do so, but not as happened in his reading. I still haven't forgiven JK Rowling for killing off Hedwig! Anyway - to the book. It follows on from Black Prism. Blinding Knife is brilliantly written and the characterisation is excellent as per usual. The series is a distinctly different fantasy series to any other and he creates a whole new range magic type with associated rules. It's a very long book so those that enjoy reading will regard it as excellent value. It may be overlong if you like fast paced books all the way through. For everyone else - this is a cracking read and I would recommend it. It has everything a fantasy fan would like. Offer concludes on the 26th November. The book is getting some really good reviews! 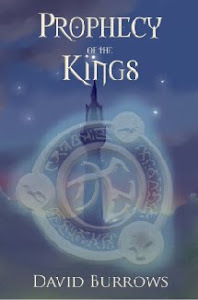 http://www.fantasybookreview.co.uk/ Action packed fantasy set 500 years before the events of Prophecy of the Kings. 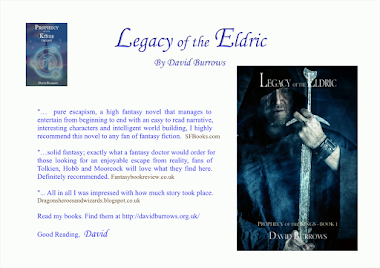 A must for fantasy fans. 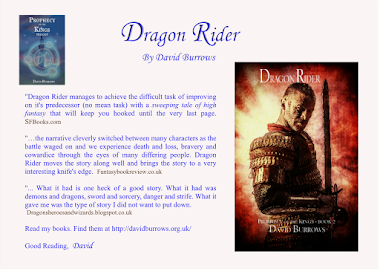 Check out my website for reviews and sample chapters. Become a fan. This is a photo of Little Morton Hall. It's the sort of property you dream of. More like a nightmare though. There's barely a straight line to be seen. All crooked. It's a surprise it's still standing, but it goes back generations. Fortunately the structure has been reinforced, but what an amazing place. And the history. Wow! It's near Chester and worth stopping off to see. Amazing courtyard. Here it is. Yuma in the dawn. Not a bad picture, but missed my breakfast! 0600 start is far too early! Wow - what can I say? Suitcase lost at LA and work starts at 0520! That's to avoid the heat of the day which even in November is HOT. The desert is gorgeous in its own way and the sunrise this morning was spectacular. A real mackerel sky and I'm hoping the photo of it does it justice. Saw a coyote today but that was about the only wildlife as most sensible creatures hide from the sun and I can't blame them. Long flight back tomorrow, a real whirlwind tour. Then back to the US, Washington the week after next. Wow. I feel guilty. The axe was in my hand and what could I do? The shed had to go! There's something strangely liberating about destruction. The moment I started tearing into the shed, ripping it apart with a crow bar and smashing rotten planks with an axe, I felt like a marauding Mongol in one of Genghis Khan's armies. I should do this more often. Only problem is - only 1 shed left. Strangely, I sense that tremor each time I walk past. That didn't save the last shed though! The problem is - it now doesn't look very aesthetic. Gone is the geometric symmetry. It's a lot shorter than it used to be be and I suspect a bit wider. Gone also is the functionality. Nothing seems to fit inside it any more. Humph.